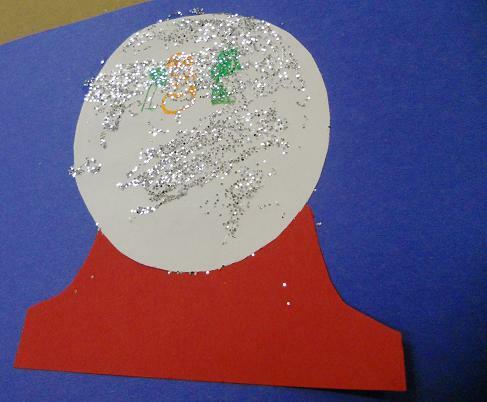 Many times my children have come home from school with an art project that was a "copy" of a famous artist. 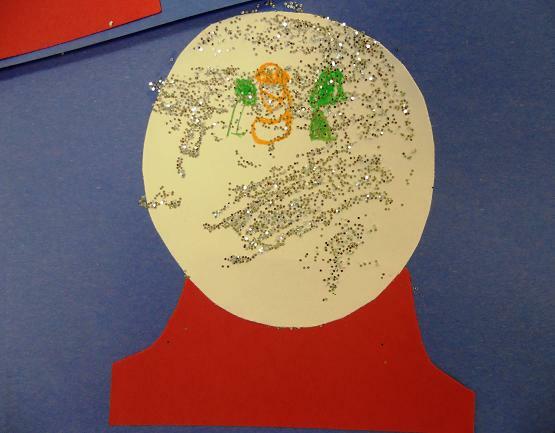 Mrs. A. came up with a project that plays on that premise. Mrs. A. had a calendar with some pictures done by young artists. 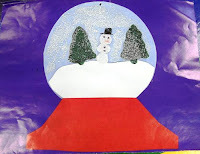 She found one that that the children could make and we could also incorporate winter with. It was a pretty snow globe. We first showed the children the picture and where it came from. 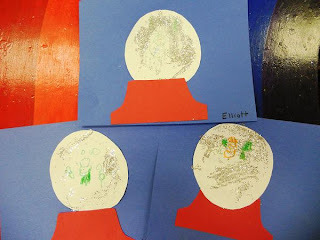 Their first step was to draw a winter scene inside of the white circle. Some said they couldn't draw, I encouraged them to draw anything that reminded them of winter. 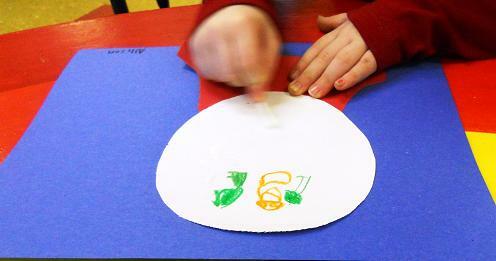 After they were done drawing, they glued the red base and white circle to the blue paper. 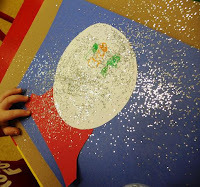 For the next step I had children spread a thin layer of glue with a Q-tip. Then the children sprinkled glitter on the glue. 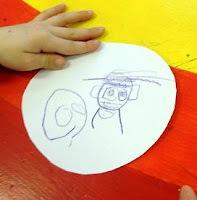 One thing we had to be careful with was getting too much glue on top of the beautiful picture they drew. I think they turned out beautifully. 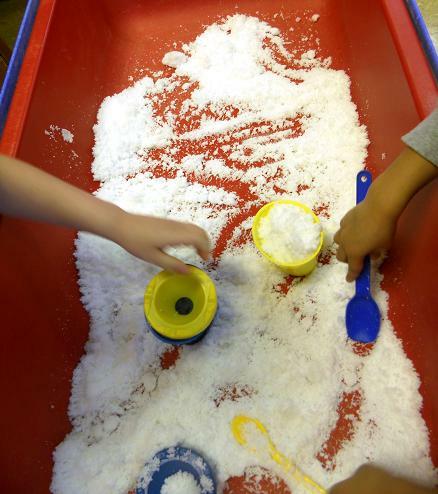 To help incorporate more fun with snow, we added "snow" to our sand table. 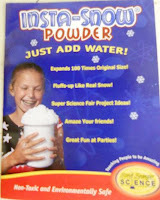 Last year we purchased some Insta Snow. It is great stuff. You put a small amount in a container, add a small amount of water, and magically you have a good amount of "snow" for the children to play with--it's even cold. Look at that snow powder! You are so brave. lol Looks like so much fun. We're going to do letter Ii today, so little man will be playing with ice! 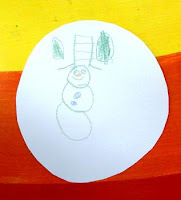 Nice blog.I loved all the pictures.If you intend to find a good pre-school for your child, there are a number of factors that you need to consider and this is one of them I find in your blog. I'm so happy with your blog site, it contains all the matter with regards to Pre Nursery School Good luck to you and your well performed job. 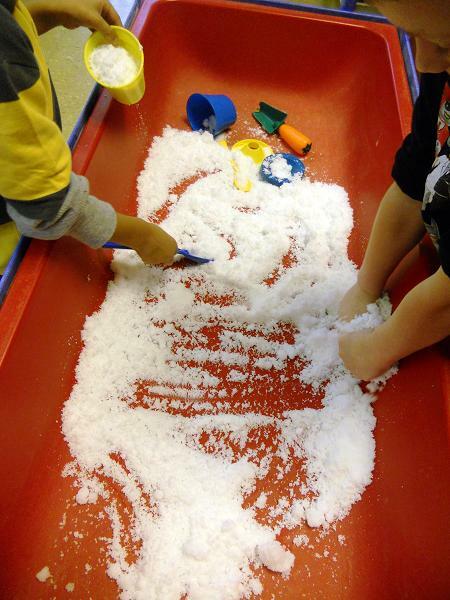 Thanks for keeping us updated with the latest information for Nursery School.